You will love the privacy in this 21st floor residence in the desirable 3 stack! Over 2,200 square feet of luxury high rise living! Breathtaking views of the caloosahatchee river and downtown fort myers. Impressive private entry foyer. Spacious kitchen is chef-friendly with abundant granite counters, wood cabinetry, spacious pantry desk for menu planning. Breakfast bar doubles as space to serve cocktails and hors d'oeuvres. Spacious master bedroom walk-in closet and ensuite bath with dual sinks, separate shower and garden tub. Your guest quarters are separate from the living area for peace & privacy. Enjoy countless hours on the screened balcony visiting with friends while watching boats cruise along or birds soar by and view spectacular sunsets! New carpet in all br's. Designer paint colors throughout. 10-foot ceilings & crown moldings. Participate in an active social life with friday happy hours, exercise classes, games, movie nights and special events planned by our social committee. Downtown has much to offer with dining, entertainment and shopping just minutes away. Get ready to fall in love with your new lifestyle! Available furnished/turnkey with a few exceptions. Mastique is luxury high rise waterfront living at its finest! Offering breathtaking tranquil views of 45 acre lake mastique and the gulf of mexico. This fully renovated home boasts, three bedroom, two bath, beautiful wood like tile flooring throughout the main area, 42 white cabinets, granite counters, upgraded stainless appliances, crown molding, and impact glass windows. A private elevator takes you up to your foyer where you enter to a spectacular view of the open great room. Just off the kitchen is the dining area that invites you to the covered lanai for additional outdoor dining and entertaining. Amazing sunsets await you. Two covered assigned parking spaces. Like no other condo living! You are minutes to the white sandy beaches of sanibel island, fort myers beach, walking distance to bunche beach and surrounded by the magnificent lake mastique with a recreation area for canoe, kayaking, sailing and paddle boating. Mastique has a gorgeous resort style pool,spa,clubhouse,bocce, & fitness center. The unit offers open, spacious floorpan completely remodeled and ready for you to move in today! Nineteenth floor residence at fabulous high point place. Move in ready. End unit with windows providing lots of natural light. Over 2,200 square feet of luxury, high rise living! Neutral interior. Chef-friendly kitchen has ample counter space and walk-in pantry. Breakfast bar for quick meals or hors d'oeuvres when entertaining, plus room for formal dining. Master bedroom retreat has spacious closet and ensuite bath. Work from home? The den is the ideal space to set up your office! Phenomenal views from both screened river-view balcony and guest room balcony. High point place amenities include a well-equipped fitness center with his/her saunas, gathering room for social functions, business conference room, library, pool/hot tub/bbq grills. Short walk to downtown fort myers' entertainment & festivals, restaurants, shopping. Tenant in place through may. Buy now (receive credit for rent) move in june! 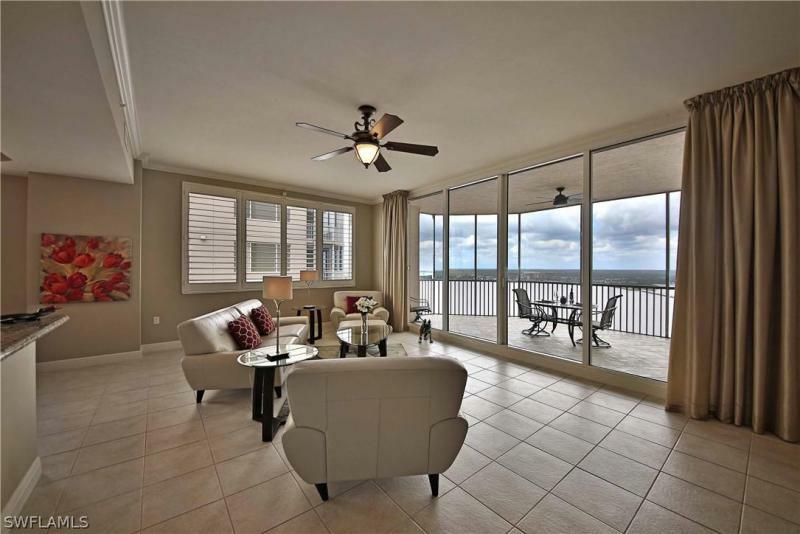 Completely remodeled 2300+ square foot 16th floor ariel condo with some of the best views in all of ft myers. This unit was a 9 month precision rehab and the owners spared no expense. Converted from 3 bedrooms to two bedrooms during the remodel. You will not see another condo that compares to this one in this high rise. Everything was touched from kitchen, baths, hurricane impact sliders, flooring, lighting, tile, top of the line kitchen aid appliances, quartz countertops, etc. Also kitchen and family room were opened up to create a better feel and give future home owner the opportunity to take advantages of the amazing views. The landings is a private gated community with amenities that include but are not limited to a 18-hole golf course, 16 tennis courts, brand new pickleball facility, bocce, two restaurants, yacht club, marina, park, pools, fitness centers, etc. You won't be disappointed. Just reduced by $10,ooo!!! Gorgeous river views in one of downtown's premier luxury high rise condos minutes from historic river district in downtown fort myers. This is the most desired floor plan due to unobstructed views from every room and has open kitchen w/ gorgeous wood cabinets, granite countertops, stainless appliances & tile floors done on diagonal throughout living areas with carpeting in bedrooms and den. Hurricane rated windows & sliders, in-fact high rises never lost power during irma. Private elevator from the garage to your private entry foyer inside the unit as well as a public elevator. Resort style living with infinity edge pool and spa which overlooks the caloosahatchee river, the bridges and city views. Amenities include fitness center, theater room, community room, library, the beautiful riviera room, bbq/picnic area, tennis courts, game room, on-site management, adjacent park for dog walking and kayak launching. Just a quick walk, trolley ride or free nickle ride to downtown fort myer's historic river district which offers great, shopping, dining, entertainment & special events. This unit has everything you need to start living the florida lifestyle.